HEARTS owner Ann Budge wants to tackle unacceptable conduct and improve communications by joining the Scottish Professional Football League board. The Edinburgh businesswoman, 68, has submitted a formal application to stand for election at the league’s AGM on July 20. She narrowly lost out in the voting to Dundee United’s Stephen Thompson last year but is uncontested this time round. Celtic chief executive Peter Lawwell and Partick Thistle managing director Ian Maxwell are the only other nominees for the three Premiership club positions on the SPFL board. Hibs chief executive Leeann Dempster and Raith Rovers director Eric Drysdale join Thompson as nominees for the two Championship places. Brechin City’s Ken Ferguson is the sole applicant for the one spot which represents League One and League Two. Budge wants to see more family-friendly atmospheres at grounds across the country by stamping out things like sectarianism, racism and other misconduct. She also insists Scottish football needs better communication all round. “I’ve mentioned communications hundreds of times. That’s a big bugbear of mine,” explained Budge. “I do understand how difficult it is and I understand a lot more about it now than I did a year or two years ago. I think we’ve got to look at everything and be forced to look. Things like unacceptable conduct too, because there’s so much focus on it. The government have focused on it. It’s absolutely crucial we get our own house in order so nobody has to tell us what we have to do. 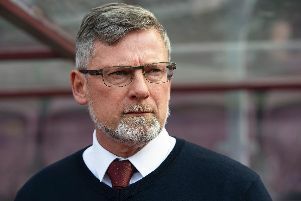 After Hearts beat the Estonian club FC Infonet in the Europa League first qualifying round, Budge stressed more support is needed for Scottish sides in Europe. “We’ve got to take a step back and say: ‘How can Scottish football be more competitive across all these areas?’ We’re changing some of the competitions within Scotland. Budge didn’t notify the SPFL of her intention to stand for election until just a few hours before Wednesday’s midnight deadline. “I hadn’t decided on Tuesday. I had one more day to decide,” she said. “I was at meetings at Hampden on Monday speaking to various people. I guess my dilemma was there’s an awful lot of work to be done at Hearts. I didn’t want to do anything that would detract from my ability to do that. “Also, there are a lot of changes that need to happen in Scottish football. I think things are moving along, I’m chairing a communications working group, for example. The Tynecastle owner admits she has detected improvement in the overall state of Scottish football since taking charge of Hearts two years ago.